There's something really special about cherries. It's the sweet juiciness of them and the way one punnet can vary in colour from bright pops of red to a shade so dark it's almost black. And the slightly complicated method of eating-chewing-spitting that's as moreish as cracking pistachios. I've always thought cherries feel like more of a treat than any other fruit. There are photos of me as baby, sitting in a campsite in France, with a face covered in purple juice after working my way through a whole bag. 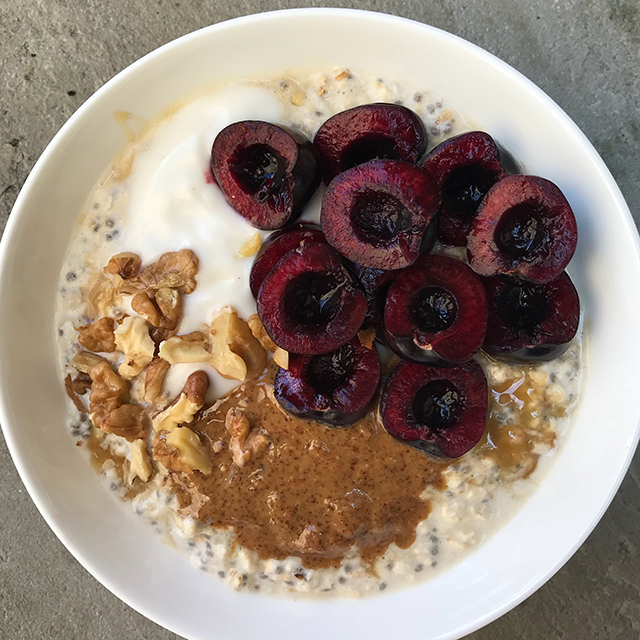 Even de-stoning cherries for recipes like these overnight oats is a joy. It's one of those kitchen tasks which is so methodical it sends you into a bit of a trance. I saw a post on Instagram of porridge topped with cherries and thought it looked like a proper weekend brekkie, a real upgrade from muesli or toast, so I tried adding them to my favourite coconut overnight oats. I used Mornflake oats because they are sooo much more delicious and creamy than any other oats I've tried. You're probably thinking "oats are just oats, they're all taste the same" but honestly, the Mornflake ones are much better. Obviously I covered the whole thing in almond butter because almond butter is life. Get ready for a bold statement. I think I've found the best cookie recipe ever. 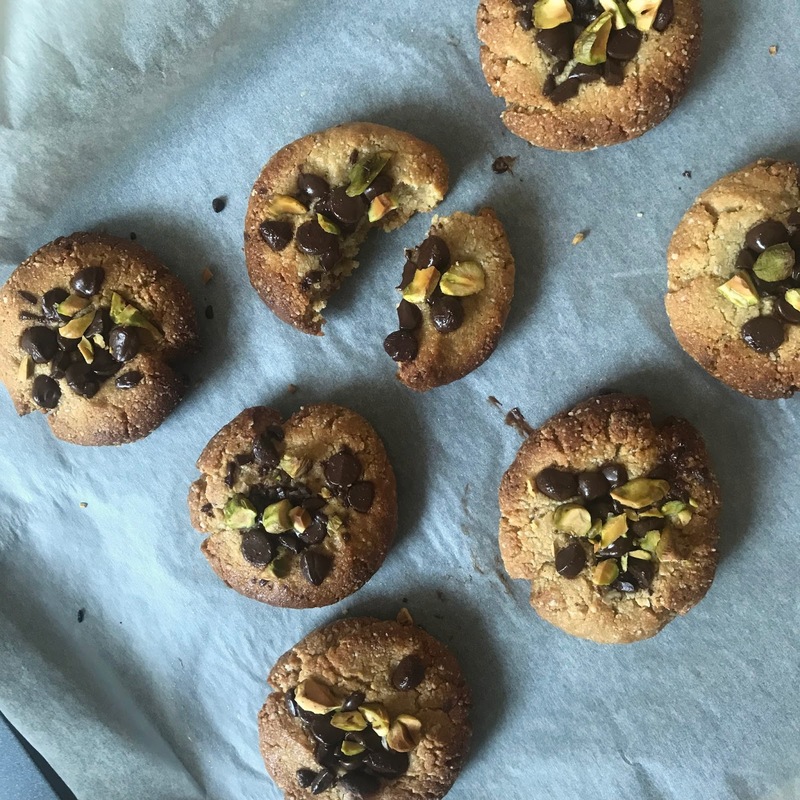 Soft, chewy, salty and sweet with a wonderfully toasty, nutty flavour from the tahini and melting chocolate on top – these have it all. Before I go on, you should know I have a bad track record when it comes to making cookies. I've pumped out tray after tray of disappointments. One attempt produced puffed up little cake pillows, not unpleasant but not what any sane person is looking for in a cookie. On my next try the results were thin, shrapnel-like discs likely to chip a tooth. I saw the recipe by Cook Republic on Pinterest and, having a serious tahini addiction, I just couldn't resist. After gently heating tahini, salt, vanilla and maple syrup until it formed a gorgeous caramelly mixture I stirred it together with ground almonds then rolled into balls, added toppings and baked for 15 minutes. It couldn't have been easier! The smell was so amazing I had to try one before even turning off the oven. Imagine warm, freshly baked peanut butter cookies meets the sweet-savoury flavour of old-fashioned sesame snaps. Add gooey chocolate and a moreish texture and you've got these. That's all it took. Seven ingredients and a matter of minutes. Oh, and they just happen to be vegan and gluten-free, too. See, told you. Best cookies ever. Preheat the oven to 150°C fan and line a baking tray with baking paper. 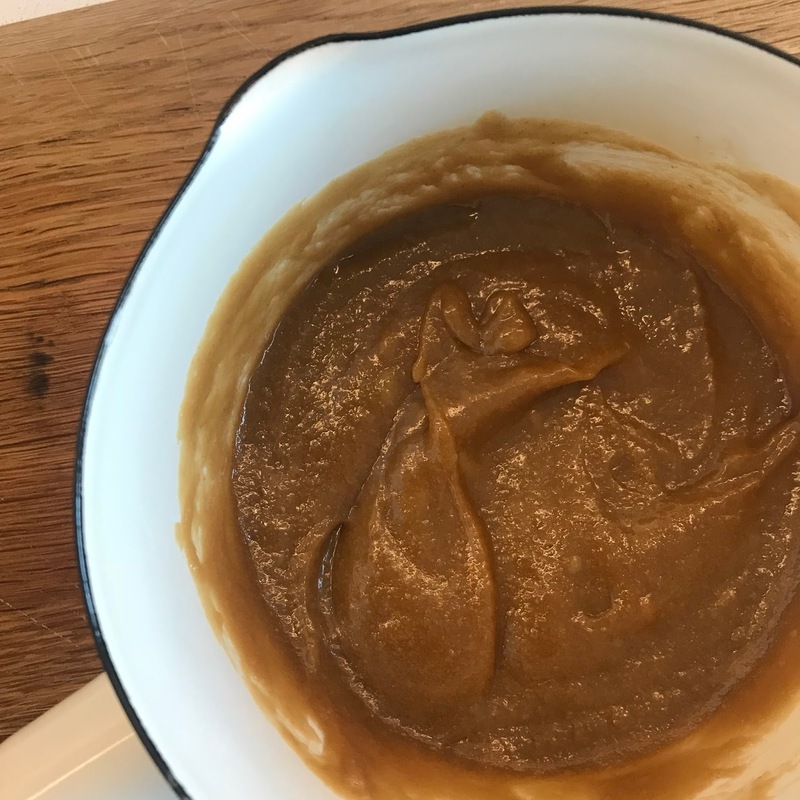 Place the tahini, maple syrup, vanilla and salt in a small saucepan on medium heat. Heat for a few minutes, stirring constantly until smooth. Be careful not to leave it on the heat as it will burn quickly. Remove from the heat and leave to cool for 10 minutes. Add the ground almonds to the melted mixture and stir with a wooden spoon until it comes together. Roll 1-2 tablespoons of dough together in your hands to form a ball. Place on the prepared tray and flatten slightly with your fingertips. If you're adding toppings, press the chocolate and nuts on top of the cookies, making sure they stick. Bake in the preheated oven for 10 minutes then switch off the oven and leave the cookies in there to brown slightly for another 5 minutes. Keep an eye to make sure they don't burn! You should cool on wire racks to get chewy cookies but these were SO good eaten warm from the oven, I'd recommend trying both. 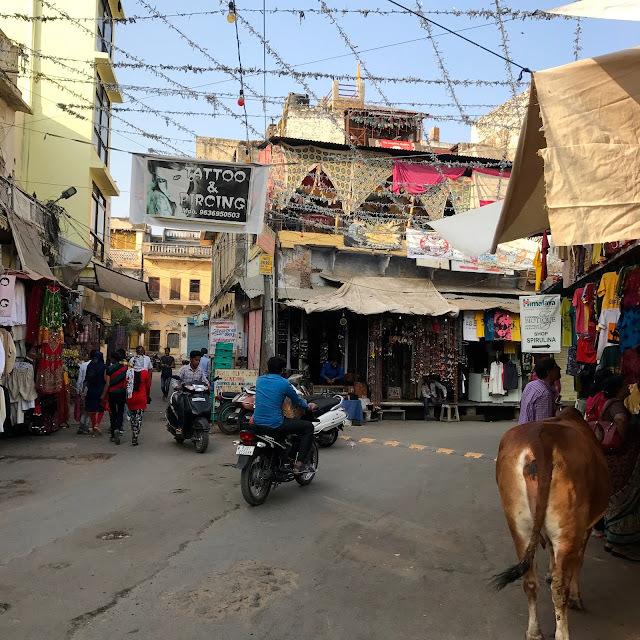 Our arrival in Pushkar was one of the most intimidating, scary moments of our whole trip. As we got closer to the small town the traffic got worse and worse until we were at a total standstill. Our car didn't move for two hours while a constant stream of Rajisthani villagers, women wearing traditional saris and nose rings, men with machetes, farmers leading camels or horses and hawkers selling sugar cane surged past us. We peered out of the windows as our driver Imran told us that around 200,000 people come to this famous event every year. We'd got it wrong. This wasn't just a fair, it was camel Glastonbury. Tension started to build in the car as Jack, Imran and I sat in silence, unable to move with so many people blocking us in and banging on the doors. A young woman draped in glittering red saw me in the back, screamed and grabbed her friends, who flattened their noses on the windows and shouted "hello! hello!" It was just meant to be friendly but made me feel like Free Willy when he's in the aquarium. Just when I thought I couldn't feel any more claustrophobic, Imran turned around nervously and said he was sorry, the police had shut the road and we would have to walk the final 2km. I know that doesn't sound far now, but wedged between so many people, my blonde hair hidden under a scarf and heavy backpack on, it felt like miles. We pored with sweat while trying to stay unnoticed and Jack navigated the way through the madness with Google maps. Some boys next to us started a fight, women pinched my arms (it's actually a sign of affection) and we got lost a few times. Half an hour of pushing, shoving, dipping and diving later we fell through the door of our beautiful (if slightly crumbling) guesthouse and Meera welcomed us with a big smile and sweet chai tea. She showed us to our clean, cosy room with its own little terrace and the view took my breath away. We could see the sacred lake, encircled by temples and bustling bathing ghats which were alive with colour, voices, gongs, chanting and cows. Mountains on the horizon turned the sky a dusty blue and birds swooped in every direction. I fell in love with Pushkar instantly. We spent our time playing cards while watching monkeys skip across the rooftops and throngs of pilgrims come to the lake to wash clothes or take a dip in the holy water. The spiritual atmosphere was captivating. At sunset, families gathered outside the temples to sing and light floating candles. One morning I was woken by the sound of women in colourful saris singing as they plaited each other's hair on the steps. Pushkar was a much calmer place (I mean calm for India) once the fair was over. We also had some of the best food in Pushkar. 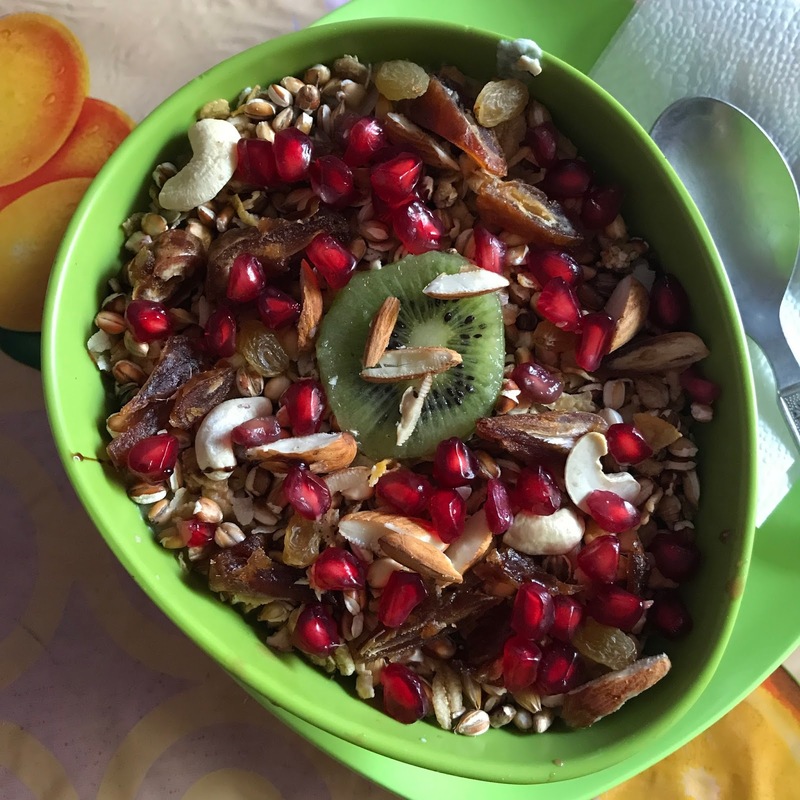 At Honey & Spice cafe (my favourite cafe in all of India) I tucked in to homemade granola with toasted grains, nuts and figs served with yogurt, banana, papaya and pomegranate... pure breakfast heaven, especially with a cup of spicy, fresh lemongrass tea. For dinner, we had an incredible cashew nut curry with fresh naan, sticky fried aubergines, a navratan korma (meaning "nine jewels", it's made with banana, pineapple, nuts and vegetables – sounds weird, tastes amazing) and a secret beer, given to us in a plastic bag, at Raaju Garden Roof Terrace. At chill-out spot Nirvana cafe I had a cup of chai so good that it set the standard for all other chai teas. Sweet, milky and fragrantly spiced with cardamom, cloves and black peppercorns. After not much convincing we tackled Hello To The Queen, a huge, mysteriously-named dessert made with bananas, crushed cookies, ice cream and a drowning of chocolate sauce – like a next-level banoffee pie. We had four nights to soak up the magical atmosphere of Pushkar and I think that was the perfect amount of time. 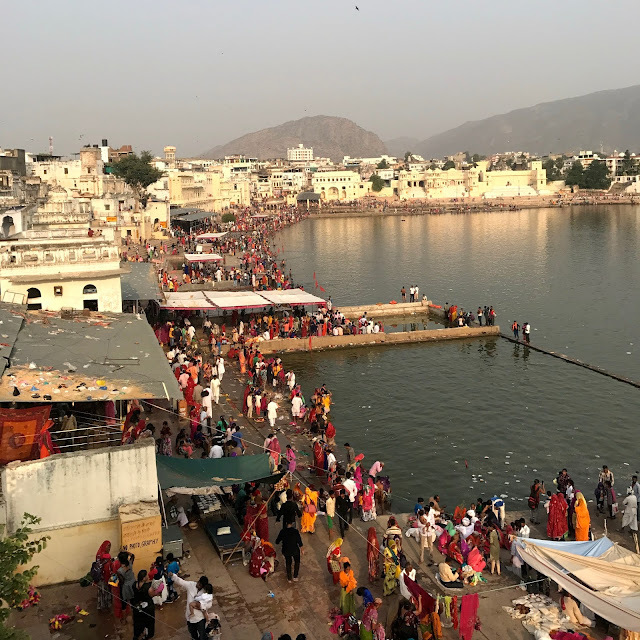 The journey in might have been really overwhelming but I forgot about it almost instantly and Pushkar still remains one of my favourite places in India.